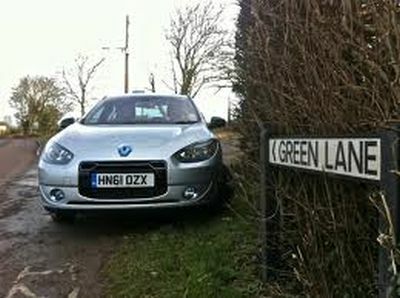 I must admit I have blown hot and cold when it comes to electric powered cars though after driving Renault’s just launched all-electric powered Fluence ZE saloon I have started to warm to the idea of this sort of vehicle, without diverting into the debate whether its electrical source was created by producing pollution elsewhere. Some years ago I smugly said to colleagues, who participated in short commute journeys to work, that a small electric car that could be charged up from a power point at the place of work would be a sensible form of vehicle, somewhat later after discovering the short range that some of these vehicles offered plus the eccentric appearance of some prototype cars, I got turned off. Visually, the four-door Fluence is a good-looking, good-sized car that would be welcome on the UK market following the withdrawal of the Renault Laguna, especially if it was also offered with a conventional power unit. When I put this suggestion to a Renault representative I was told that such a vehicle did exist but not for the UK market, so it is battery power only which turned out to be no bad thing and set up the Fluence to serve a potentially profitable niche market. Certainly here is a car for those who appreciate a quiet life for, apart from a slight degree of wind noise, and little noise according to road surface from the low friction tyres, the Fluence wafts along in utter silence. The electric motor delivers 95 hp over an exceptionally wide range between 3,000 and 8,900 rpm and with bags of flexibility. Drive is to the front wheels via a seamlessly smooth changing automatic transmission. In mixed traffic conditions, though on open roads, the performance is satisfying, suggestive of an efficient 1.6-litre petrol engine and the performance figures issued by Renault give a top speed limited to 84 mph and acceleration from rest to 62 mph (100 kph) as 13.7 seconds. There is a range of 115 miles between re-charges so the cost per mile really depends on how much you pay for your electricity (or who pays?) plus the battery rental fee that is based on annual mileage, the maximum being £118 for 18,000 miles over a year. Road tax is nil and currently congestion charges can be ignored. I tested the Fluence on my own and I suspect it would be a slightly different performance story if the five comfortable seats were fully occupied and what luggage could be crammed into the smaller than average boot space. Alternatively, further luggage capacity, at the sacrifice of up to three occupants, is freed-up by the 60/40 split folding rear seats. However, considering that so many cars are used to a high percentage of their life with just the driver on board, then things fall more into perspective. The Fleunce is certainly aimed at those who like the easy life, the ride quality is to the high standards I expect from Renault, the handling positive once one get used to the light feeling but reactive steering action, the braking smoothly efficient and the stability a strong factor. In a nutshell a point and go driving characteristic. The driving position, aided by a tilt/reach adjustable steering column and seat height adjustment, proved very comfortable, Renault not skimping on the generosity of the seat cushioning and with only two pedals there is plenty of rest room for the in-active leg foot. Driver vision is generally very good, the high rear window being augmented by a rear parking sensor system – rain sensitive windscreen wipers and automatic halogen light-sensitive headlights also make important contributions. The well presented fascia is less cluttered than a conventionally powered car, such instruments that remain are simple clear faced dials though the obvious addition is a battery econometer. At the time of writing the Euro NCAP crash test figure was not available but as a pioneer of 5-star rating I suspect that the Fluence will hit a high score; as it is it comes with a six airbag system, hill-hold facility ABS/EBD and brake assist braking, stability and traction control and dead locking. For equipment it has few sacrifices, you get alloy wheels (no spare, just a repair kit), automatic dual zone air conditioning Tom Tom intelligent satellite navigation with driving range and charge points indicated, cruise control with speed limiter, radio/Bluetooth/CD/MP3, AUX input and fingertip control plus ISOFIX child seat fittings and an anti-intruder device. An optionally extra charge cable, leather upholstery and rear sun visors are listed extras. Finally, open the bonnet and at first glance it looks like a conventional engine but in fact it is a plastic moulding that to me is suggestive of a component from an Airfix kit. A Renault spokesperson said it was intended to make the customer feel more at home with the product…well I suggest, after all, that there is a bit of eccentricity in this electrically powered contender! Range approx: 115 miles. Price from: £20,324. VOLKSWAGEN: The medium-sized Volkswagen Amorok pick-up 4x4 model is to be produced in the Hanover factory from the end of June at a rate of 40,000 vehicles a year for supply to Europe and Africa. Previously the vehicle was sourced from a plant in Argentina.